You can text or email us any questions you have about any of our products. Pacific Standard Time, no phone calls after 8 pm please. Text and email fine any hour. The best way to contact us is by text, we are receiving a high volume of robo calls and don’t want to answer every one of them. If you text to the number below, we’ll get it right away. If emailing us, be sure to add details to the subject line, otherwise there will be a longer delay because the email will go to the clutter or spam folder. Thanks! Hi, I have just complite my registration on your website. I try a few days ago to do an order ..but at the check-out aren’t possible close the order payment because the shipping cost aren’t computable for my adress in Italy. How could I do my order? I have many items to order into your website. I have not run into a problem with any orders from overseas with one exception. If you are ordering dummy ordinance, we’ve restricted shipment. The reason for this is the fact that USPS doesn’t allow dummy ordinance to go air mail. Nor does UPS. If it’s ground in the USA, we can ship it. If it’s overseas, the cost and regulations are just too much. If that isn’t the case, email me at bryan@serviceofsupply.com or text me at 15093071297. I can help figure out a different way to get the transaction done. Thanks! I ordered 10 packages of the 2 inch black safety pins (6 in each package) to replace missing ones on my USGI bandoliers. I placed the order for them on 3/22 and today 3/25 they arrived in the mail. Super fast shipping and prompt processing of my order. Thanks for a professional hassle free online transaction. I look forward to doing business with you in the future. Thanks Jeff, we appreciate the business! I have a residential address and a postal address due to the postal system not delivering in my area. My credit card details will only show my residential address. Do you post to post boxes? And if so, how do I get your web system to integrate both addresses? No, we don’t make reproduction uniforms. The wool G.I. overcoat is an item that I’ve not seen reproduced. 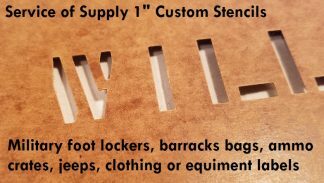 There might be a chance that WWII Impressions, At The Front, or What Price Glory is making them. Otherwise, it’s Ebay. Good luck. Hello. Parcel arrived this day. Thank you for this transaction between the United States and France. Glad it made it. Sorry about that customs duty, that really stinks. 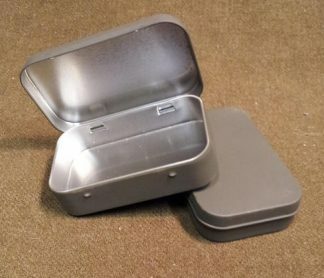 Do you make a stamped D ration box for USMC ? No, sorry we don’t. I didn’t even know there was a USMC version? Interesting. Know what it looks like? Have an original? We can ship everything we make to Europe with the exception of dummy ordinance. No grenades, smoke, or bullets. Can we be notified when an item is back in stock? If so, how do we do this. Hello, I recently purchased a replica WW2 M1 Garand . I was just wondering if the dummy clip on this site can actually be used inside of the rifle ? It is a Denix replica..thank you ! If that gun takes real bullets, then yes. These dummy rounds are genuine WWII era brass and a US made original clip. I want buy some product of your shop. Can you shipment to south korea? Thanks for those kind words. We do our best to make everything as “correct” as possible, and I do appreciate the business! Thanks! hey are you guys planning on restocking all of your grenades? there are another few that i definately would like to purchase! awesome thank you! how about the smoke grendades? everything is currently out of stock, any plans to restock them? i definately will purchase more of them! Oh yes, it’s a tedious process, so when we get a rush, it’s hard to catch up! They are in production right now, all types. Should see more smokes by next week, or the week after. awesome thanks again! you guys are great! With the “Rubber Reproduction AT and AP rifle grenades” when shooting off of a Yugoslavian sks what blanks do you recommend using? I can’t tell you a specific brand, but ONLY use the crimped “Hollywood” type blanks. 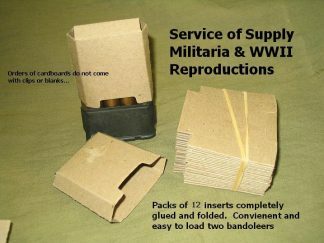 Military grade or military surplus blanks are too powerful. These rubber dummy rifle grenades were developed for reenactors, so using anything but the crimped blanks could result in damage to the grenade, your rifle, or you’ll shoot it so far you will never find it again. Some places to find blanks include, but are not limited to; Atlantic Wall, Swanson’s Blanks, or Sportsman’s Guide. You will see an email directly from our site, and if you have dummy ordnance, you will see an email from UPS. Your order in fact is ready now, and it out tomorrow morning. Tracking will be in your inbox tonight! 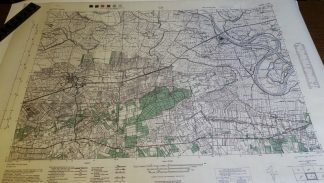 Do you folks plan on restocking your D-Day maps? I’ve been looking forward to getting my hands on the Ste. Mere Eglise. Yes, we do plan to restock the Ste. Mere Eglise for sure. We have a lot of set up with the maps, so once we can arrange the time, materials, and machine, we’ll get another batch done. Terribly sorry about the status of these, you’re not alone. Hopefully I’ll have more details soon. Thanks for the inquiry. Thanks, we’re closer than February. Handkerchiefs are on the machines now, and sheaths when new leather arrives. We will be ready with a quantity of utensil sheaths and handkerchiefs by the next weekend. We have a few in stock now of the sheaths, but will have lots available later. Yes, as soon as the weather breaks. Painting them in cold temperatures, even in hour “heated” garage, doesn’t work. So we have to wait until we get some better temperatures to paint. I don’t think we’ll have to wait until April, I think we’ll see some better days mid to end of February. Sorry about the delay, we’ve learned our lesson and will have many more made over the summer! 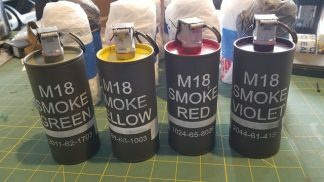 I wanted to place an order about smoke grenades. The problem is the shipping adress, I´m living in Belgium and put the correct adress in but I get a reply that there is no shipping posible? I’m so sorry to have to give you this news. The reason you are unable to complete the transaction is because we can’t ship these to Belgium. Netherlands is just as bad. To England and France they have to go USPS first class international and it cost an arm and a leg because they have to go Registered Mail. Your country unfortunately there is a ton of issues, so unless you are up for the paperwork on your end, we just can’t do it. There is an application and permits you have to get, and even then the customs might stop it. Yes that is some bad news, but nothing to do about it.